Mama always took us kids with her to buy groceries in the summertime. One particular grocery day, as we got home and unloaded all the bags, Mama realized she hadn’t paid. She hadn’t done it on purpose. The cashier never asked, so Mama hadn’t given her the money. But that wasn’t who she was. Without hesitation, she piled us all back in the car and we drove right back to Food Town on Randleman Road. We followed her inside, and Mama found the same cashier and said, “I’m so sorry. I forgot to pay for my groceries. Here is the receipt, and here’s the money.” I remember how Mama didn’t try to blame the girl. She took the responsibility on herself, and treated her with kindness and respect. The girl immediately burst into tears and said, “I would have been fired. This is more money than I make in a week and I couldn’t have paid it back. I can’t thank you enough.” Mama patted her hand and said, “Oh now, don’t you cry. It was the right thing to do.” And with that, we went back home. Honestly, she didn’t do it to teach us anything, even though it surely taught me a huge lesson. She didn’t even really discuss it with us. There was no speech on the way to Food Town: “Now you young’uns watch while I do a good deed here. Let’s see if the manager will give me some sort of reward.” She never even told the manager. She did it because who she was inside was reflected in her behavior. So many times throughout Scripture, the relationship between the heart and behavior is addressed. Who we really are, what we think and feel, comes out in how we act and how we treat others. At first glance, what Jesus says in Matthew 5 can be a bit confusing. 27 You have heard that it was said, ‘You shall not commit adultery. 28 But I tell you that anyone who looks at a woman lustfully has already committed adultery with her in his heart. 21 You have heard that it was said to the people long ago, ‘You shall not murder, and anyone who murders will be subject to judgment.’ 22 But I tell you that anyone who is angry with a brother or sister will be subject to judgment. I don’t know about you, but I’d rather someone be mad at me than murder me, and I’d rather my husband commit adultery in his heart than have a physical affair! You probably would too. However, there’s more to it than just our behavior. Jesus wants to change us from the inside out. If you are greedy and selfish in your heart, you have already stolen a buggy full of groceries from Food Town. Here in the South, we try to soften it with, “Bless her heart” so it doesn’t sound so harsh. We can say anything in the world as long as we tack that phrase on the end. “Her buck teeth are so bad she can eat corn through a chain link fence . . . bless her heart.” See how that works? We can say we’re “kidding”, but I guaran-daggone-tee the girl in question is in dire need of orthodontic work, and she knows it. What’s in the well comes up in the bucket. Every. Single. Time. You might can fake it for a while, but who a person really is eventually comes out. Just give it some time. He will do it because He doesn’t want to just change your behavior. He wants to change you on the inside. He wants what’s in the well to be so much love, that when it comes up in the bucket, it will overflow to everyone around you. That’s the only change that will last. Growing up, Mama kept my cousins Darrell and Melissa after school and all summer. She carried us along on all her shopping excursions and errands in our trusty 1968 Pontiac Catalina. For some unknown and illogical reason, the worst, most embarrassing place in the world for her to take me shopping was K-Mart. I would beg, “No, Mama, please don’t go to K-Mart! Let’s go to Sears! Or Zayre’s! Anyplace but K-Mart!” I guess I didn’t want my schoolmates to think we were poor and couldn’t afford pricier places to shop. My pleas fell on deaf ears. It must have been Christmastime because, Lawd ‘a mercy, the place was packed. My worst fears were realized as I recognized a classmate from school. In full blown stealth mode, I slid into the middle of a circular clothes rack and hid, trying not to breathe. Relief flooded my soul as I peeked out through the women’s blouses to find the boy apparently hadn’t seen me. Crisis averted! Quiet as a church mouse, I waited for him to head to a different department. A SWAT team armed with tear gas couldn’t have gotten me out of that clothes rack until then. ATTENTION K-MART SHOPPERS!!! ATTENTION K-MART SHOPPERS!!! Would DEE BUNTON please come to the front desk!? Paging DEE BUNTON! Please come to the front desk! Your cousin Melissa can’t find you! Oh the shame!! Melissa had me PAGED?! Now not just the boy in my class, but everyone in the whole store knows I’m here! I was still shook up when Daddy got home from work. I tried in vain to explain why I was so upset. Didn’t they know that boy could go tell everyone at school he’d seen me there?! I’d be the talk of the entire 6th grade! Daddy said,”Why would he go tell people you were poor enough to shop at K-Mart? He was there, too!” I couldn’t see past my own selfishness to understand that logic. All that mattered was someone at school knew our dirty little family secret — we shop at K-Mart. The boy never spoke of it as far as I know, and neither did I. Maybe he didn’t want it made public that he was a fellow K-Mart shopper. Maybe he was proud that his family took advantage of Blue Light Specials. Maybe his world didn’t revolve around me and he never gave it a second thought. Either way, my fragile 12 year old reputation was spared a painful death! Several years and a measure of maturity later, I had graduated from college and gotten off my parents’ dime. I was home for Christmas and needed to pick up a few more small gifts. Naturally, Mama and I went to K-Mart. “No, Daddy, I didn’t.” *Insert eye roll* — he was a funny guy. That pretty much summed it up! I didn’t give a flip who saw me at K-Mart when I was the one paying the bills! It was all about perspective, you see. I wasn’t able to understand my parents’ point of view until I was in their shoes, many years later. Having the benefit of age and maturity, Mama and Daddy wisely refused to spend hard earned money on a more expensive place to shop just so I wouldn’t be embarrassed. That’s a surefire way to raise a spoiled, materialistic child. When I was in the Valley of the Shadow of Death/the Dark Night of the Soul, there were a couple of people that had been less than gracious to me who later ended up going through a divorce themselves. One came back to say she just didn’t understand until she’d actually been there, and she sought my forgiveness. I cut her some slack — knowing I most likely have done that to someone else myself along the way. There were others who were supportive from the get-go, putting their arms around me and comforting me with, “I’ve been there. I know you feel heartbroken. I lived through it, and you will too.” It gave me hope to see others had survived, when I wasn’t sure I would. Then there were those who had NOT been in my circumstances, yet they were able to imagine what it might feel like. Their kindness and support made quite an impact on me both emotionally and spiritually. And equally as important to me are those who have genuinely been glad that I have found a happy, joyful life again, and have told me so! Oh the heart of a soul who is able to put themselves in someone else’s shoes, even if they have never and maybe never will walk in them — to find a way to empathize with someone else’s pain and heartache, joys and successes, and be able to feel it in their own hearts. Can you do that? Can you ascend to a level so deep that you can feel what others feel? Can you see their pain, or their elation, and imagine their perspective? Sometimes, empathy and compassion are what we all need most. All sorts of emotions encompass everyone in your life, day in and day out. Try to imagine their circumstances, see with their eyes, and feel with their hearts. If they’re grieving, grieve with them. If they’ve gotten some great news, be happy not just FOR them, but WITH them. Give them a call, send them a card, an email, or even a text. A nice pat on the back goes a long way. There is something supernatural about stepping outside your own circumstances and into the life and heart of someone else. It makes us expressly human, and somehow we find its a better world for us all. Back when my life consisted of stay-at-home wife and mothering and ministering to teenagers, there was a boy named Robert in our youth group. He was from a different high school than the other kids, and his mother made him come because she just didn’t know what to do with him anymore. She was a single mom, trying her best to raise an angry teenage son on her own. This boy hated God and flies and everything in between. All the rest of the kids were at least intimidated, and mostly scared of him. It seemed he wanted to be left alone, and they obliged his wish. I didn’t leave him alone. I always spoke, always gave him a quick hug and told him I was happy to see him. He’d grunt and nod. That was about all I got out of him, but I figured surely he needed to know someone was glad he was there. On trips, we always took a caravan of 15-passenger vans, and if we didn’t have enough youth workers to drive, parents would help. There were no cell phones back then. The only way to communicate was two-way radios. On our way back from camp that particular Spring, a mom driving one of the vans radioed me to say she needed help. There was a boy on her van trying to kick the back window out. I told her to pull over into a parking lot and I’d handle it. That boy was Robert. He was about 200 pounds of muscle, and I realized right off the bat he didn’t really want to kick the window out, or it would already be shattered on the pavement. I had 14 high schoolers on my van, and she had 14 on hers. Every one of them had eyes as big as saucers as Robert kept kicking. “Okay then, everyone else off.” Thirteen other teenagers silently slid off their seats and stood in the parking lot as I tried in vain to reason with him. “Then kick it out if it you need to. Matter of fact, I’ll pay for it myself. Obviously something has upset you pretty badly, and for some reason, kicking out a church van window will make you feel better. With that, I sat back, crossed my arms, and waited for his next move. Somehow, some way, the Spirit of God let me see into his heart for a split second, and I saw a hurting young man. The pain in his eyes shone through just long enough for me to have compassion, long enough for me to see through his tough guy image and get a glimpse of a young man who needed love. Unconditionally. He looked at me like I had two heads. He couldn’t believe what he’d heard — but he stopped kicking. After a few seconds of staring at me in shock. His face broke into a smile. “You’re a crazy lady,” he said. He grinned some more and I said, “Can we head home now that you realize kicking out the window is a waste of time?” He agreed we could. From that day on, Robert loved me back. He smiled every time he saw me. He would wrap those big arms around me and hug me hard, so hard I couldn’t breathe. When he’d get to church, he always sought me out, no matter where I was. And he never left without saying goodbye. He wasn’t much for chitchat, but he was always cordial. We never had another day’s trouble out of him. I’d like to say I’m still close to Robert, but the truth is, he moved away and I never heard from him again. I don’t know if he ever found anyone to see though his tough as nails exterior into his heart. But this one thing I know — that day, that one day, he found out he was loved no matter how unlovely he behaved. Oh don’t get me wrong, if MY kids had been doing that, I’d have beaten them like red headed stepchildren! They might never have seen the light of day again! But Robert didn’t need any more discipline, he didn’t need any more anger, anyone else to tell him what a bad kid he was. I imagine he’d seen and heard quite a bit of that in his 17 years. What he needed was for someone, anyone, to see he was hurting. Something on the inside of him was so painful that it had to come out. What good would a shouting match have been? If I’d started yelling at Robert, do you think he would have stopped? Heck no. That window would have been toast. And I dang sure wasn’t gonna physically remove him. He was twice my size. I’m tough, but I ain’t that tough! Look around you. Listen closely. Sometimes those who are the least lovable are the ones who need it the most. The very last thing this world needs is one more angry voice. Be the soft answer that turns away wrath. A multitude of sins doesn’t stand a chance against love. When I was in college at Arizona State University, I was lost in a crowd of tens of thousands of students. My senior year we won the Rose Bowl, and Rolling Stone magazine said we were the best college campus to get a tan. Quite a different life for this country girl from Pleasant Garden, NC where we had one stoplight, and it wasn’t even at an intersection! It’s very hot in Arizona in August. When I say hot, I mean temps nearing 120 degrees in the shade. I remember students frying eggs on the hoods of their cars! The hottest place on campus was called the Commons. It was in the center of everything — all concrete, no shade. One day as I was hurrying through the Commons to get to class, I heard someone yelling. I looked up to see a man and woman standing on a picnic table in sweltering heat. He had on long sleeves and long pants. She was wearing a dress that went from her chin to the tips of her toes and fingers. They were sweating bullets. They were angry, scowling, and waving Bibles in the air, screaming at everyone walking by that we were sinners bound for Hell because we were students at ASU. You see, our mascot was the Sun Devil, and therefore, our campus was evil. Oh and because we were wearing shorts and short sleeves — that, too. The crowd was incensed. People were yelling back at them, and many braved the heat and sun to stand and debate them. I didn’t. I just walked away, sad and burdened, ashamed that those people would represent God in such a hateful way. I wanted to shout, “Don’t judge all Christians by these people!” but I realized I’d be just one more person yelling. In the next edition of our school newspaper, I was even more saddened to read letters students had written about the Picnic Table Evangelists, all saying, “This is why I’ll never be a Christian.” That couple did far more to damage the Kingdom than to advance it at ASU, I’m afraid. Not one person wrote in to say, “Thankfully someone told me I was a whoremonger, and that made me want to know Jesus!” I wrote in as well, desperate to defend a loving God, but my letter was lost in a sea of anger left in their wake. After I graduated in 1987, we moved to Virginia. The TV was on in the other room one night as I was cooking dinner. From the kitchen, I heard someone yelling, “WHORES! WHOREMONGERS!” I ran into the living room, already sure of who I’d see as Sally Jesse Raphael’s guests. None other than the Picnic Table Evangelists. They spewed their venom, just like they did the first time I saw them. There were some Christians in the audience who tried in vain to say that’s NOT how God is, but they were shot down. The Picnic Table Evangelists neglected to mention a Savior who loved the world so much He would die for them, or any word of His forgiveness, kindness, grace or mercy. They just screamed and pronounced everyone as sinners bound for Hell. Folks, let me tell you something. The most dangerous people in the world are the ones who are angry, dogmatic, convinced they are right, everyone else is wrong, and worst of all, that God is on their side. There is no arguing, no convincing, no amicable discussion with a person who thinks God is supporting their agenda. The truth is, people like that flew planes into the World Trade Center. It is the Holy Spirit’s job to convict, God’s job to judge, and my job to love. Maybe you’re not as mean and angry as the Picnic Table Evangelists — I sure hope not! There are many times we need to defend the weak and defenseless, times to speak up. And believe me, I do! But we must ALWAYS speak the truth in LOVE. Whatever we need to say, we can say it with kindness. As the old saying goes, no one cares what we know until they know that we care. All you have to do is scroll through your Facebook newsfeed to see every opinion all over the map. Everyone is convinced they’re right and anyone who opposes them are idiots! It’s exhausting at best. We must remember the same Jesus who loved and died for disabled veterans, babies, animal foster families, and the candidate for President you support, also died for the Picnic Table Evangelists, abortionists, Bruce/Caitlyn Jenner, cop and lion killers, and the candidate for President you can’t stand. God’s love transcends the latest media hype, and it reaches to the lowest depths of humanity. May we live that out with every person in our paths. God help us love people, today and every day, whoever they are. In the end, that’s all that matters. This past weekend, we got to reminscing about dc Talk’s “Jesus Freak,” and we YouTube’ed some of their old songs. I could still sing along with every line! Immediately, I was taken back to a time and place where I spent my days surrounded by teenagers who were themselves a bunch of Jesus Freaks. Those days will always be some of the best memories of my life. Lord only knows where that CD is now, so I’ve already ordered me another one (free shipping, of course — Amazon Prime ROCKS). Aren’t we all human after all? If you need some fresh songs on your iPod, throwback to some old school dc Talk. You’ll be glad you did. I felt compelled to go to the church, to pay our respects, and to pray for this family of God as they deal with this tragedy. News crews were all over, but they didn’t disrupt the reverence. The heat index was over 100, and someone was handing out bottles of water. Todd asked her how much, and she said, “They’re free”. Love was as tangible as the humidity. 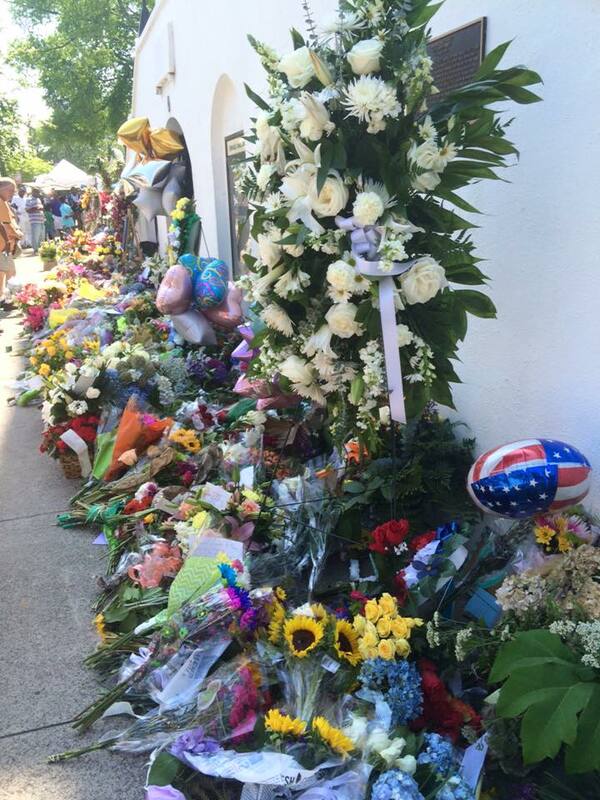 Person after person walked up and placed flowers, many shedding tears and holding hands. The prayer on my heart was, “God please let Your love cover hate.” I took these pictures, and I’m sure many more flowers have been placed by now. Although the shooter meant to start a race war, he failed miserably. Quite the opposite happened. Charleston is a town unified. And the unity is spreading. He took the lives of nine people, who gained eternal life on the spot. 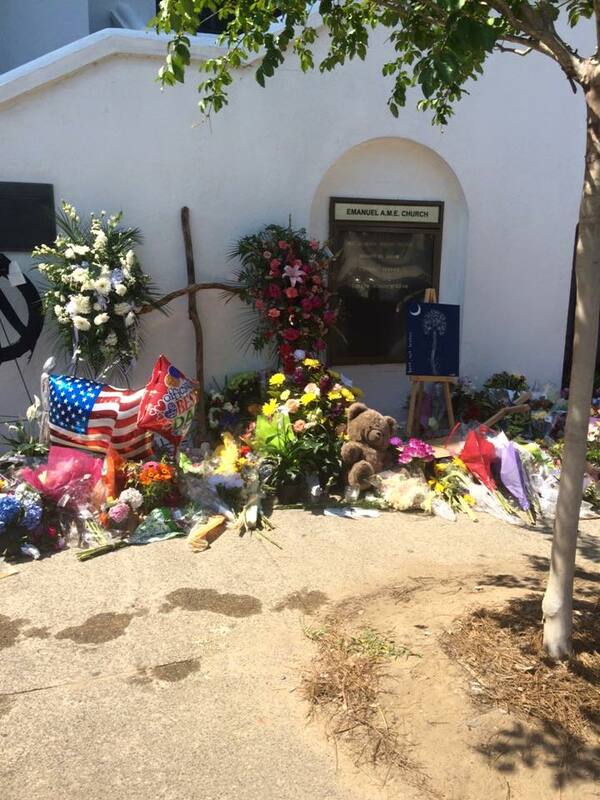 Sudden death meant sudden glory for the martyrs of Emanuel AME Church. If we look at it from the spiritual realm, it was a great victory! But alas, we are left here to deal with the fallout in the physical world. 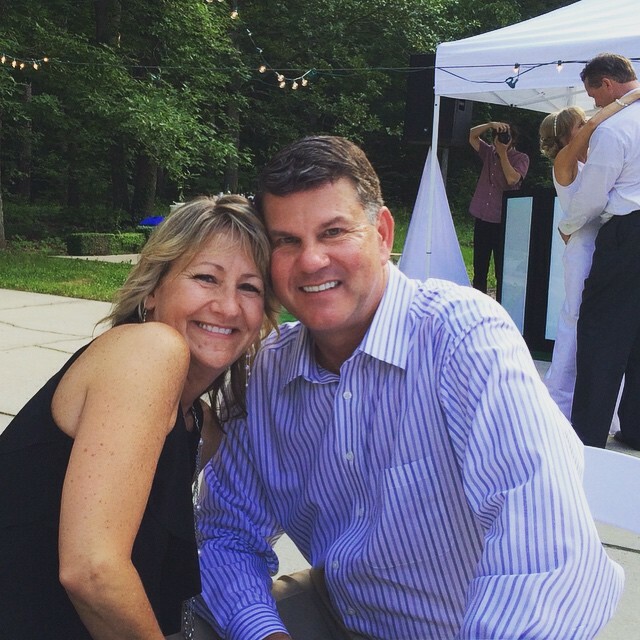 Let me share a couple of stories with you — you’ll find a lot of those in this blog. Story #1: My grandpa raised tobacco (that’s pronouced “tuh-BAK-uh” for you non-Southerners). When my daddy was about 5 years old, a new family moved into the farm next to theirs. His only playmates were his siblings, and he was thrilled to have some new kids to play with. Only these children were different. They were black. Daddy was afraid they wouldn’t want to play with him because his skin was a different color. Meanwhile back at the ranch, his older brother, Jim, had a black Model-T Ford in the barn that he was painting. Daddy’s little five year old brain began to devise a plan . . . He had finished painting his 3 year old sister, Mary, head to toe with black car paint, and she was in the process of painting him when my Grandma Bunton went to find out why her two toddlers were missing. I can only imagine her reaction! “What in tarnation!? !” Daddy explained how he wanted to go play with those new kids, and he was afraid they wouldn’t play with him if he didn’t look like them. Grandma told me she took half their skin off scrubbing them with turpentine! A word to the wise: car paint doesn’t just come off with a bar of soap. Story #2: When Lindsey was still an only child, our next door neighbors were black. They had a little boy the same age as Lindsey, and we would frequently watch each other’s kids so we could run errands or have a date night. One day when Cameron was at our house, Lindsey said, “Mommy, why is Cameron’s skin brown?” I told her that was the way God made him. Simple answer for a simple question. That was good enough for her, and she ran off to her room to play Sesame Street with Cameron. And if it’s good enough for a two year old, it’s good enough for all of us. We aren’t blind. We all look different and we know it even at the earliest of ages. But what we DON’T know, is hate, judgment, prejudice, and superiority. Those things are not just taught, they’re CAUGHT. Somewhere along the way, the Charleston shooter caught the idea that it was okay to hate people, to judge them based on the color of their skin, rather than the content of their character. Be careful what people catch from you, folks. Spread love over hate. Love is the only thing that overcomes hate, and it ain’t gonna spread itself. It’s our responsibility to do the spreadin’. We live in an evil world, and sadly, more horrific acts like the Charleston shootings will mostly likely go down in the books. But there is good news! I’ve read the end already, and love wins. They say the L Word a lot at weddings. LOVE is the word of the day! It’s a happy occasion. Life is good. People are cleaned up and on their best behavior. The future is bright, full of promise and hope. Plenty of laughter, happy tears, eating, drinking and being merry! Using, and even feeling, the L word at a wedding is fairly effortless. Where the rubber hits the road is trying to love people when they’re not cleaned up, when they’re miserable, crying, and full of despair, when their lives are messy. Back during the bleakest time of my life, which I affectionately call The Dark Night of the Soul, people would see me in Walmart and react in one of four ways. I can’t see people’s hearts, so I don’t know for sure, but I’ll describe how I perceived each scenario. 1. Give me a hug, say, “I’m so sorry” and tell me they were praying for me. Yes, yes and yes! I had never needed a hug, never needed sympathy, never needed prayer more in my life. When faced with seeing someone hurting, you don’t need to worry if you don’t have the words to say. Just love on them. 4. Glare at me in undisguised and unashamed disgust and turn away in a huff. Having been in church my whole life, I knew this one was going to happen. I had fallen from grace. Sadly, somehow, somewhere along the way, someone decided people with broken lives are bad advertisements for the church. He didn’t say they’ll know us by how we’re dressed. Or where we go to church, or IF we go to church, or how we look, or how we talk, or where we’re from, or what music we listen to, or what we eat or drink. The true mark of a Disciple of Christ is LOVE. No other litmus test. Just love. So if you’re wondering what to do with yourself this happy Monday, try this: Love people. We’re all fighting a battle of some form, and the world already has enough anger, hatred and judgment. Someone in your path today feels defeated, scared, hopeless and unloved. You know what it feels like to be torn down. So build people up. Hold the door for someone at the grocery store. Tell the bank teller she looks pretty. Wave at your neighbor mowing his yard. Tell the grieving widow you’ll pray for her, and actually DO IT. Speak a kind word to the lady at work who is always nasty. And if YOU’RE the one who’s always nasty, for Pete’s sake, stop it. People with broken lives aren’t the ones who are bad advertisements for Jesus . . . .